An employee demonstrates a Blackberry Playbook tablet at a Best Buy store in Chicago, Illinois, April 19, 2011. At a San Francisco event last September, Research in Motion  the company whose BlackBerry phones rank among the most iconic gizmos of all time  announced its first tablet, the BlackBerry PlayBook. RIM played a splashy video about the device, detailed its features, and issued a press release laden with words like "unmatched," "uncompromised," and "unique." The one thing it didn't do was show off a working PlayBook  presumably because the tablet wasn't yet in any shape to be seen in public. Seven months later, the PlayBook hit the shelves this week, one of the highest-profile contenders yet in the market pioneered by Apple's iPad. I've been spending time with a unit loaned to me by RIM, and judging from my experience...it still isn't in any shape to be seen in public. For every feature that works well right now, there seems to be one that's glitchy, half-baked, or simply missing. Some of the attractions that got me enthused about the PlayBook when I attended the launch still hold, starting with its compact size. Like Samsung's first Galaxy Tab, it sports a sharp 7-inch touchscreen, giving it a paperback-like personality compared to the larger, more magazine-like iPad 2. There's no such thing as one true ideal size for a tablet, but seven inches has its advantages: you can cradle the PlayBook in both hands and use your thumbs to swiftly tap your way around the interface, in a sort of modern counterpart to the thumb-typing that made the original BlackBerry famous. For a starting price of $499  the same as the iPad 2  the PlayBook provides some serious hardware muscle, including a zippy dual-core processor, 1GB of RAM, 16GB of solid-state storage, high-definition cameras on its front and back, Wi-Fi, and an HDMI connector for output to big-screen TVs. 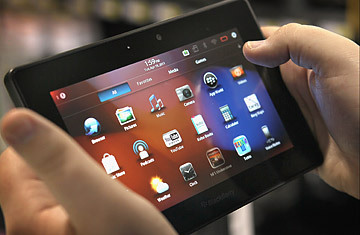 You can't get a PlayBook with a built-in 3G or 4G wireless connection yet; RIM says those options will come along later. Rather than merely rejigger the aging software it uses on BlackBerry smartphones, RIM started from scratch with an operating system designed with the PlayBook in mind. The user interface pays the sincerest form of flattery to HP's WebOS, as seen on the Pre phone and the upcoming TouchPad tablet, but it's easy to pick up and fun to use. Swipe upward, for instance, and you get access to other apps; swipe downward, and you get features such as the ability to open new tabs in the browser. Everything's fast and fluid, even if you've got a bunch of programs open. Some solid software comes preloaded on the PlayBook, including a Web browser that's on a par with the ones on the iPad and Android tablets, plus a word processor, a spreadsheet, and a tool for viewing (but not creating or editing) presentations. In a decision that's tough to fathom, however, RIM decided to ship this supposedly "professional-grade" tablet without e-mail and calendar apps of its own. Instead, the tablet can piggyback on a BlackBerry phone's Internet connection over Bluetooth and display big-screen versions of the handset's e-mail, calendar, to-do list, and notes. As for third-party apps, RIM says that the PlayBook's App World already has 3,000 programs  not too shabby for a brand-new platform. Standard offerings such as Twitter clients were scarce when I checked, though. And some of the ones I tried, including a note-taker and a solitaire game, were embarrassingly rudimentary  more like homework assignments for a programming class than commercial products. For me, though, the biggest disappointment about the PlayBook in its initial form doesn't involve the absence of apps. It's how quirky RIM's software is  a problem I ran into immediately when I swiped at the screen as instructed during the initial setup process and nothing happened. At one point, the BlackBerry Bridge inbox started wobbling up and down for no apparent reason; the on-screen keyboard sometimes failed to pop up automatically when it should have. Then there's the PlayBook's support for Adobe's Flash Player, the application  used for videos, games, and ads  which Apple refuses to allow onto the iPad and iPhone. As on tablets based on Google's Android 3.0 Honeycomb software, Flash is allegedly a major selling point for the PlayBook. Some of the movies I streamed from Amazon's Video on Demand service did look superb. Much of the time, however, Flash video and games behaved strangely or didn't work at all  or simply crashed the browser. Some folks may consider thoroughly unreliable Flash to be better than no Flash at all, but I'm not one of them. Unlike the earliest PlayBook reviewers, who used preliminary versions of the operating system, I experienced the device using the software that the first paying customers are receiving. Getting this tablet out appears to have been more important than getting it right. Still, almost everything that's lacking stems from software shortcomings. RIM will surely squash at some of the bugs I encountered. It says it'll add more apps and features (including full-blown e-mail) and that the PlayBook will run not only software written specifically for it, but also programs designed for BlackBerry and Android phones as well as Adobe's Flash-based AIR platform. A few months from now, the PlayBook could be a dramatically better product than it is now  but I'd wait and see rather than plunking my money down just yet. Other tablets rushed out in the wake of the iPad have suffered from a similar slapdash quality. Samsung's first Galaxy Tab, for instance, used a version of Google's Android operating system that was meant for phones, not tablets. And early adopters of the Motorola Xoom got a machine with a buggy version of Android and without three major promised features: 4G wireless, Flash, and the ability to plug in a memory card. So far, only Apple has managed to release a tablet that doesn't have a slightly experimental feel to it. Now that the PlayBook is out, the next major milestone for tablets will likely be the release of HP's promising TouchPad. All HP says about availability is that it plans to ship it "this summer." But you know what? After having used the Galaxy Tab, the Xoom, and the PlayBook, I'm in no rush. If the company needs more time to make the TouchPad as good as it can possibly be, that's fine by me  and it just might be the smartest long-term strategy for HP, too. Take a look at the new BlackBerry Torch.